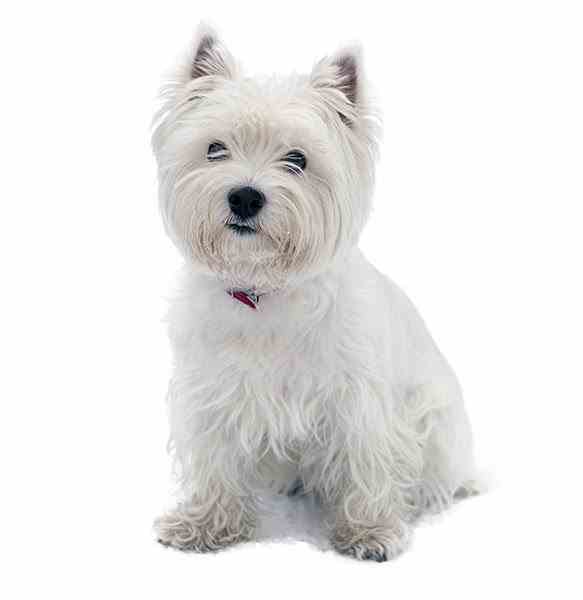 The West Highland White Terrier is best described as alert, active, independent and friendly. They are quick to win your heart with their energetic persona and their bright white coat that just accents their button eyes, making them an initial hit among anyone who loves a people oriented canine. You might know the West Highland White Terrier from his famous picture on the Caesar food can, or the adorable dog owned by Kahn, Hank’s neighbor depicted on the old TV series King of the Hill. Without a doubt, there is much more to endear you to this breed than their cute face. Vigilant, Friendly, Spirited, Robust, Active, Independent—these are all words used to describe the Westie’s personality. While not considered to be hyper, they are energetic and will need plenty of exercises which suggest that they might not be suitable for couch potatoes. They do love to roam and a walk or two each day will help keep meet their curiosity requirements. Basically, they want to be doing what you are doing, so they work very well for an active single, couple or family. As far as getting along well with children, this breed is well suited to older, respectful children who have been taught to care and understand a young puppy. They do not do well with small toddlers and may get too excited if expected to live in a home full of rambunctious children. Too much excitement and these dogs are known to nip, not necessarily on purpose but during active play sessions. While active with plenty of energy, some make great lap dogs. Most are too independent to sit quietly on you for extended periods of time, but still prefer to be near you, and in the same room. There is little difference in the genders - each making a great pet. The breed as a whole usually gets along well with other dogs and household pets, but as you might expect, two unaltered males may not become best friends, especially if an altered female is nearby. Spaying and neutering the dog will take care of any issues in this regard. Since Westies were originally developed for catching and killing vermin, it is not surprising that they have a high prey drive. The West Highland White Terrier will view any small household pets as potential prey, so hamsters, guinea pigs or gerbils do not stand much of a chance in a home with a Westie. West Highland White Terriers normally do fine around other dogs. Keep in mind that this breed has a couple of concepts of fun that some owners may not approve. Digging, Roaming and Chasing are on any Westie’s bucket list of fun activities. Careful supervision and training can curb many of these tendencies. All of the shorter legged terriers of Scotland including the Scottish, Skye, Carin, Dandie Dinmont and West Highland White Terrier were bred to hunt small game. As the story goes, one day one of Colonel Edward Donald Malcolm of Poltalloch, Argyllshire, Scotland’s red dogs was mistaken for a fox and killed. After that, Malcolm decided to breed only white dogs so they could be seen and recognized during a hunt. 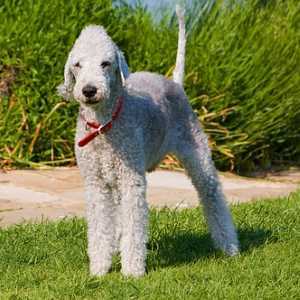 These dogs were called "Poltalloch Terriers." Later, Malcolm did not want to be known as the father of the breed and asked that the dogs be renamed. 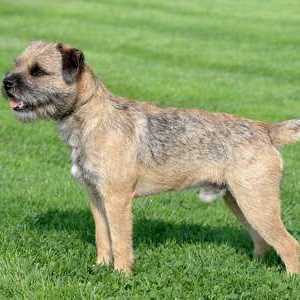 The first breed club was set up in 1904 and first recognized by the Kennel Club in the U.K. in 1907. During the same time, the breed, then known as the Rosenearth Terrier was imported into the United States and recognized by the AKC in 1908. It was renamed the next year to the West Highland white terrier. Over the 20th century, they gained popularity. Now, they hold an AKC ranking of number 42 in 2016. 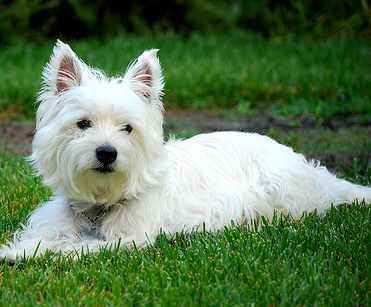 The West Highland White Terrier comes in one color: Can you guess what? As most people who have ever owned a small breed dog knows, housebreaking is usually the most difficult part of training. The good news for the Westie is that they are much easier to housebreak than other small breed dogs. Positive training methods work very well with this breed, and they respond not only to food and toy treats but also praise and attention. Some do very well in obedience trials as they primarily want to please. There is that “what’s in it for me,” streak that is found so often in small breed dogs, so patience is the name of the game. They are smart, curious and will become bored quickly if not given enough stimulation. Keep that in mind when planning your training and socialization. New owners must understand the historical purpose for why these dogs came to be and that is hunting and vermin killing. 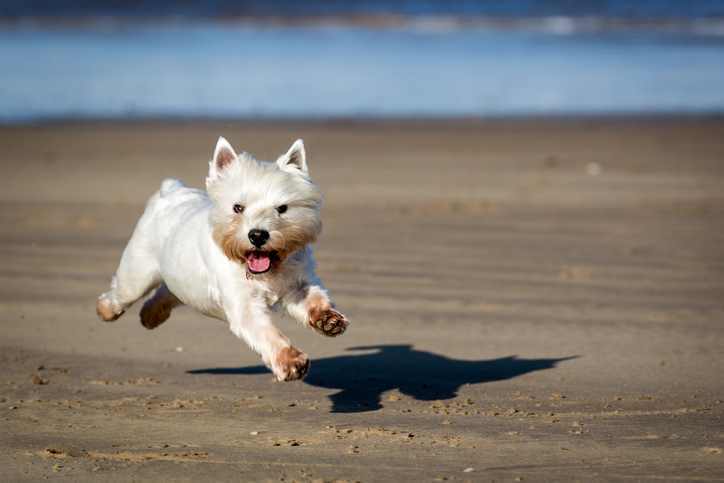 To be successful, the West Highland White Terrier needed to chase, dig and roam looking for their prey. Today, most of these dogs are housepets and owners do not expect them to hunt vermin. However, the digging, chasing and roaming are all still part of the packaged deal that comes with these friendly loyal pets. If there is no fenced in yard in which to romp and play, it is advisible to keep your Westie on a leash. When outdoors at all times. Watch dog yes, Guard dog, no. They make great watch dogs and will announce any visitors to your home with a decent bark. They will not likely serve you as a guard dog due to their small size and friendly nature. They do bark but are not considered yappy. If you happen to get a puppy that frequently barks, a little extra training will help him learn when it is inapproprate to bark. Don’t rule out the West Highland White Terrier just because they are all white. White is beautiful, but you might think that it is nearly impossible to keep that gorgeous coat looking white. You might be surprised. Westies can get very dirty, but once the mud dries, the dirt can easily be brushed out. The Westie has a double coat with an inner coat being soft, and the outer coat being harsh. Puppies have one coat—the outer hair. Their soft inner hairs will not grow in until about a year old. Grooming a show Westie is very involved, but for the pet, grooming is less intense. A good brushing with a slicker brush followed by combing with a greyhound comb takes care of any snarls and keeps hair smooth. Also, their outer coat tends to prevent dirt from remaining on the dog. Even mud can be brushed off after it dries. Good news for allergy sufferers, though as this breed does tend to be lower in dander than most so they may be a good choice for someone with an allergy. They do shed, though, but not as much as most. Regular brushing always helps reduce shedding in any dog, and the Westie is no exception. Most pet owners prefer to have their dog groomed professionally every 6 to 8 weeks. When done this way, their coat is clipped making the texture of their hair softer than would be the case for a Show dog. If that Show Dog appearance is what you love, learning to hand strip the coat is a must and usually the best way to learn this is the breeder or groomer familiar with this technique. Hand stripping rather than clipping will retain the wiry texture of the coat. Most pet owners prefer to have their Westie clipped by a groomer or learn to do it themselves to save money. Cliping the coat entails using a pet clipper and shapping the coat into the desired “Westie” look. The coat becomes softer to the touch with clipping. Stripping is a must if you plan to show your dog in confirmation. 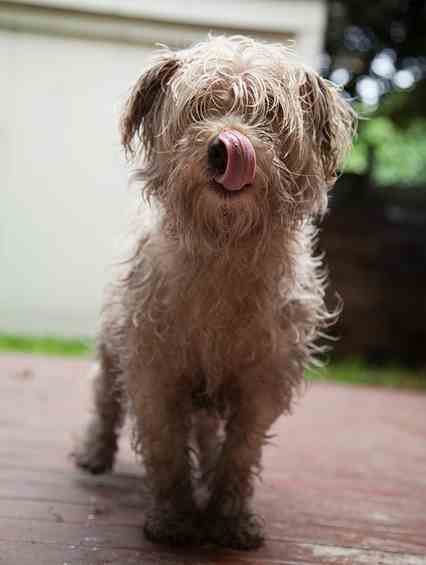 Stripping removes dead hairs and tends to keep the coat coarse and harsh typical of a wiry coat terrier. 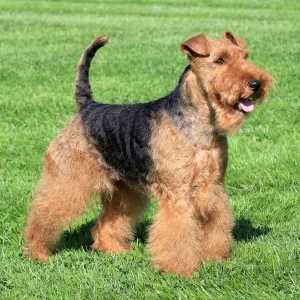 Stripping is more time consuming and costlier to have done by a groomer, so most pet owners opt for the Clippers. If cost is a factor and grooming your West Highland White Terrier at home is a real alternative. The cost of professional clippers is about the same as a couple of professional grooming visits and well worth the investment. Giving a bath about once or twice per month is usually enough as most Westi Hightland White Terrier’s coats tend to repel dirt. However, if your dog goes outside and loves to dig in the dirt, he will get dirty, so one way to keep him cleaner between baths is through brushing and combing the coat. Even wet mud will dry and be shaken off, or you can towel dry him then brush when his hair is completely dry. Some owners will use corn starch on the coat sprinkling it on, fluffing out the hair and then brushing. Corn starch or other products keep the hair clean and odor free. There are also professional products that you can purchase to use as a “dry bath” in between regular bathing. Other grooming tasks include brushing the teeth, clipping the nails, and trimming any hairs from between the foot pads. Westies do shed, but not as much as you might think. Brushing daily or several times a week will help with this. Red stains on paws and beard hair may result from saliva from the dog’s mouth. Allergies are another major culprit of itchiness in dogs which results in scratching and licking. If the hair is red down to the roots, the cause may be a fungal infection. Red staining around the face may be due to other environmental factors, such as the type of water bowl you use, the dog food, the use of tap water instead of bottled water, or even the soil where you live. Try switching to a water bottle instead of a bowl or use a ceramic or stainless steel bowl for water. Some facial washes can be effective if used regularly, but we do not recommend harsh treatments such as bleach or a high strength hydrogen peroxide espeicially near the eyes. Like all dogs, West Highland White Terriers are prone to particular problems many of which are genetic in nature. Although the list seems long, it does not mean that one dog will ever suffer from any of them. The Westie Foundation has been instrumental in identifying and assisting breeders and owners with health related concerns of this breed. The last health survey reported by this organization occurred in 2011 in Italy, and the results were similar to another study done in the U.S. in 2007. Atopic dermatitis is the dog’s version of “allergies,” that many of us people experience daily. 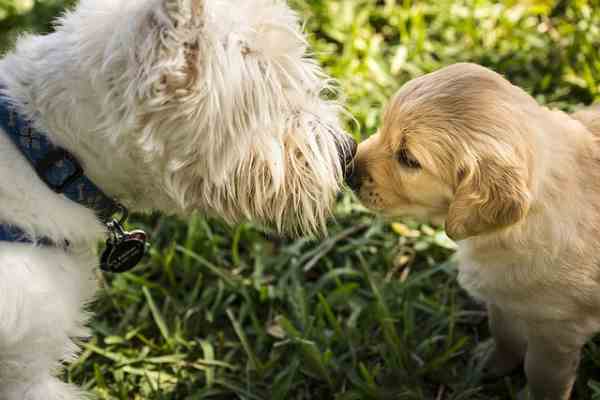 It affects at least 10% of all dogs and is more common in some breeds including the West Highland White Terrier. When a dog has allergies, the symptoms are more likely to manifest themselves in the skin rather than the usual coughing, sneezing, and runny noses seen in people. Their skin becomes red, inflamed and is very itchy. Allergies in dogs are normally in response to something in the environment such as dust, pollen, or chemical toxins. The dog will lick and scratch to relieve the symptoms but in so doing will create even more problems in the skin. Treatment usually involves identifying the allergen and eliminating it from the environment if possible. In addition, medicated shampoos, the addition of some form of a fatty acid supplement, and administering antihistamines on a daily basis relieves many of the symptoms. While not life threatening, atopic dermatitis can be very uncomfortable for the dog and stressful to the dog owner. Patellar luxation or luxated patella is very common in small breed dogs and involves the knee cap. This article describes Luxating Patella in depth. Dry eye or as it is medically known as keratoconjunctivitis sicca (KCS) is a disease that is caused by a deficiency or lack of the watery substance in tears. It causes inflammation of the cornea and surrounding tissue and leads to dry, irritated eyes. 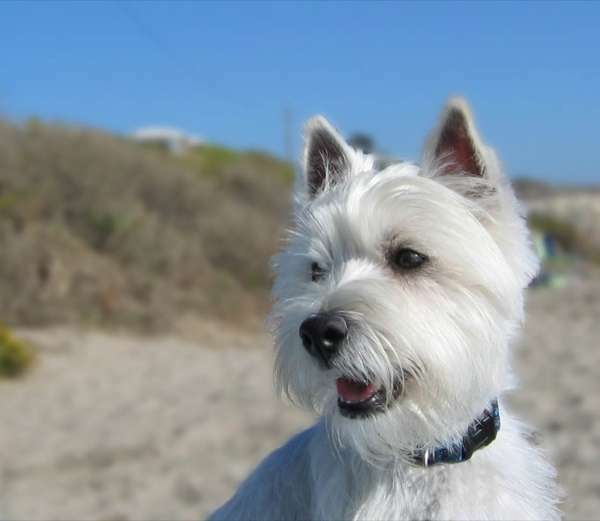 Dry eye is common in many different dog breeds including the West Highland White Terrier. There are quite a few causes of dry eye in dogs including some that are congenital, some caused by infections, some that are the result of other veterinary interventions such as drugs and anesthesia, and some as a consequence of the disease. Most are diagnosed after the dog is brought into a veterinary clinic with irritated eyes, massive discharge or the dog is always pawing at his eyes in an attempt to reduce the discomfort. Treatment usually involves the administration of an antibacterial agent, an anti-inflammatory product and a tear replacement that will be given throughout the dog’s life. For an in depth look at Legg Perthes Disorder, read it here. Craniomandibular osteopathy is a disease that causes jaw deformities in puppies usually under one year old; it is also known as lion jaw or Westie jaw. It is an autosomal recessive disorder, meaning that both mother and father must be a carrier to pass on the defect to their offspring. The bones around the jaw thicken causing problems for the dog to chew and swallow their food. Treatment involves administering anti-inflammatory medicine and offering a soft food diet. Some animals live with the disease throughout their lives, but if the dog cannot eat and seems to be in pain, euthanasia may be the only option. This problem can occur in all dogs but seems to be more frequent in Westies and other terriers. Pulmonary refers to the lungs and Fibrosis means scar tissue. When pulmonary fibrosis occurs, the normal lung tissue is replaced with scar tissue which gradually reduces the lung’s ability to function properly. Unfortunately, this disease is not easy to diagnosis in the early stages. Diagnosis is difficult because of the symptoms including exercise intolerance increased respiratory rate and labored breathing can occur in other conditions as well. Initially, the vet must rule out typical signs of aging, congestive heart failure, and pneumonia all of which mimics Pulmonary Fibrosis. The survival rate is usually only a year, though some dogs do live longer. Since this condition occurs in both people and dogs, there is a good chance that clinical research will result in better treatment options very soon. Diabetes can occur in all dogs, though some may be more prone to it due to heredity. Genetics is not the only cause of diabetes, though and most dogs can live long lives if their conditions are managed properly. Initial symptoms include increased thirst, increased urination, hunger and weight loss. If not treated or managed well, secondary problems can occur. Diagnosis is made by testing the blood and urine for excessive glucose. Treatment consists of diet and exercise management and daily doses of insulin. White Dog Shaker Syndrome is a neurological disorder primarily seen in white dog breeds such as the West Highland White Terrier but also in the Maltese and Samoyed dog breeds. 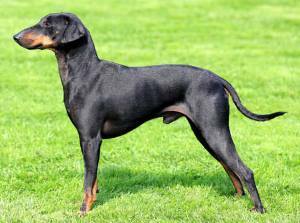 It is characterized by a generalized muscle tremor in young dogs, age five months to 3 years old and the cause is unknown. This article describes Addison's Disease symptoms, causes, and treatment options. Copper is a trace mineral that plays a part in the different metabolic process especially enabling enzymens to carry out biological activities. Some of these include the elimination of free radicals, the production of ATP which is responsible for body energy and plays a role in the uptake of iron and the manufacture of pigmentation. Supposedly, dog food provides the necessary amount of copper in the diet, but that is hard to determine based on dog food labels. Sources of copper in the diet can include fish, some mollusks, cashews, sesame seeds, liver, beans, olives and other items that are not safe for dogs such as raisins, cocoa, and avocados. If healthy dogs consume too much copper, it is excreted in the bile. In some breeds such as the Westie, the body is unable to excrete the excess copper, and it begins to accumulate in the liver leading to liver failure. It is currently thought the copper toxicosis is due to an inherited defect in the copper metabolism. The West Highland White Terrier is frequently used in advertisement and branding. Have you seen Westie on the Black & White Whiskey label? My Dog Brand Dog food made by the Australian dog food company, Mars, Inc.
We'd love to hear your experience with your Westie(s). Please share your advice, your recommendations, and your personal experiences. 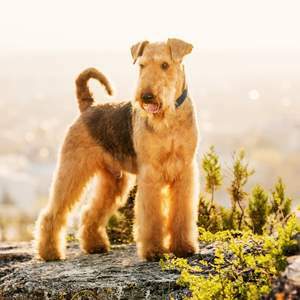 Do you recommend this breed? Tell us why.